POMPEY’s Checkatrade Trophy campaign resumes against Arsenal under-21s tonight (7.45pm). The majority of the Fratton faithful would want to see the Blues exit the much-maligned competition at the hands of the Gunners. 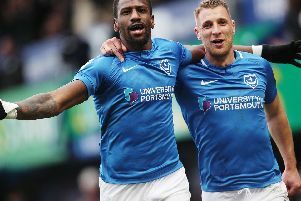 But some of Kenny Jackett’s troops will be thinking differently, with tournament offering players on the periphery precious minutes and an opportunity to catch the eye of their manager. The former Tottenham keeper made 50 appearances for Pompey last term following his close-season move. Craig MacGillivray’s summer arrival dislodged McGee as Kenny Jackett’s No1 keeper this campaign, though. The 22-year-old has made only four appearances this term – three coming in the Checkatrade Trophy and the other in the Carabao Cup loss to League One rivals AFC Wimbledon back in August. The Waterlooville left-back enjoyed a breakthrough season last term, featuring 16 times. But Lee Brown has forced Haunstrup to become a bit-part player this term, despite signing a new two-year deal in June. He's played seven matches so far and hasn’t started in League One since the curtain-raiser victory over Luton. Further progress in the Checkatrade Trophy will be crucial for Haunstrup and his football development. The fans’ favourite has slipped down the pecking order at Pompey this term. Rose has made just a solitary appearance in the League One title charge, with his other three appearances coming in the Checkatrade Trophy. The forward's only two appearances have been in the Checkatrade Trophy as he still seeks his League One debut since joining from non-league Bromley in May. Dennis was named man of the match against Tottenham under-21s last month, however, following an impressive display. He will be looking to build on that performance when Arsenal visit PO4. The QPR loanee misses the clash against the Gunners because of a back/hamstring injury. League appearances have been scarce for Wheeler, however, as his quest to oust Jamal Lowe from Jackett’s line up has been fruitless so far.